I have previously used a term favored by the University of California at Berkeley Political Scientist Ken Jowitt–“recovered memories”–to discuss the penchant of former Securitate personnel to rewrite the past, specifically what happened during the Romanian Revolution of December 1989. Not to be outdone, former Military Prosecutor General Dan Voinea–the source of the 2006 CPADCR Tismaneanu Final Report’s conclusions on December 1989–also suffers from “recovered memories.” For example, in the following interview with Dan Andronic http://www.evz.ro/dan-voinea-nicolae-ceausescu-a-fost-sacrificat-de-comunisti-pentru-comunism.html , Voinea wishes us to believe that Iliescu, Roman, Brucan, Stanculescu, Magureanu, and the rest of the core of the National Salvation Front attempted unsuccessfully to liquidate Securitate Director Iulian Vlad during these days (he has previously told us that they attempted, unsuccessfully, to have Voinea himself liquidated). But, that’s not all. 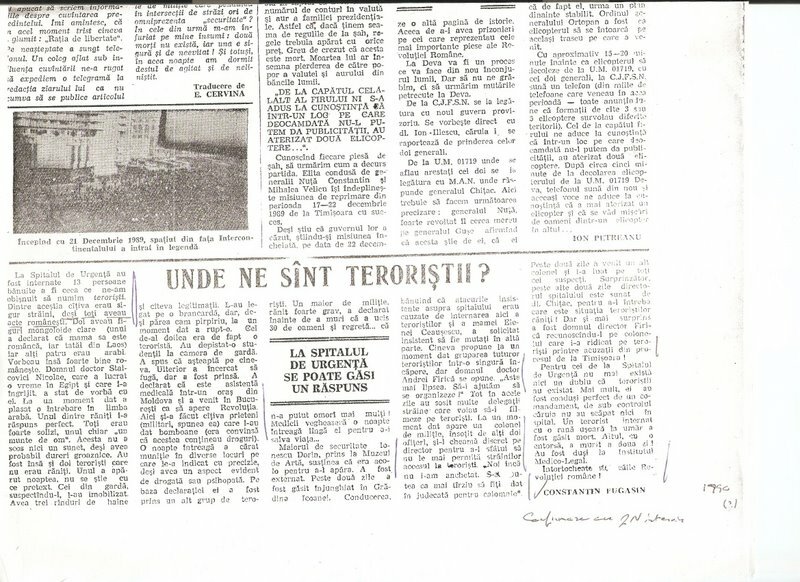 Dan Voinea also indirectly confirms once again that during the days of December 1989, he released people who had been arrested as “terrorist suspects.” One can and should only ask then: how is it possible that he could be expected to, or should, admit that there had been real terrorists in December 1989, when he himself had personally released suspects, determining on the spot that they had been wrongly accused?! Talk about a basic conflict of interest which should cast doubt on his impartiality and his ability to objectively investigate the “terrorist” question! The case he invokes is laughable, but not in the way he seeks to present it. Demonstrating how the tandem of cunostiinte and pile of PCR functioned, it turns out that the rumor about the “terrorists” wearing three layers of clothing was because, wait for it, they were dressed for the cold! and they had three identity cards because that’s what they had to carry to work in the Casa Poporului, and thus, clearly, his friend from his hometown whom he found among the arrested, had been arrested by mistake, it had all been a misunderstanding! Get it? Ha Ha Ha! How silly! INDEED!!! – Dan Andronic: Deci ați avut și cazuri în cele 40 de dosare, de străini care au tras? – Dan Voinea: Erau și străini reținuți ca teroriști. Primul dosar pe care l-am avut a fost cu unul Gabriel Matei. Era reținut la Poliția Capitalei, l-am audiat și am constatat că era muncitor la Mecanică Fină. Avea pasiune pentru fotografie. La întreprindere avea un laborator foto. Și când au plecat să demonstreze împotriva lui Ceaușescu l-au luat și i-au spus: „Fă-ne și nouă poze”. Au ajuns în Piața Palatului, au intrat în clădirea Comitetului Central, a continuat să facă fotografii. A făcut schimb cu un jurnalist străin, care a murit când s-a tras întrun avion care mergea de la București spre Belgrad. Și el a fost reținut ca terorist. Gabriel Matei a ajuns ziarist până la urmă. Apoi a povestit că la Poliția Capitalei veneau ziariști, îi scoteau, îi arătau acestora, nu le dădeau voie să vorbească, îi puneau la zid, s-au dat poze cu ei în ziare. N-a făcut nicio acțiune cu caracter terorist. Următorul dosar pe care l-am avut a fost cu cinci teroriști îmbrăcați în trei rânduri de costume. Erau reținuți acolo. I-am scos. Unul dintre ei, Pană, avea o cicatrice pe obraz. A făcut armata cu mine. Știam că-i zidar. Când l-am văzut, l-am întrebat: „Mă, ce cauți tu aici?”. Eu eram în uniformă, el nu m-a recunoscut. I-am zis: „Bă, eu sunt Dan Voinea, colegul tău de grupă, am făcut armata la Drăgășani”. Zice: „Dane, tu ești?”. „Da, am ajuns procuror militar și tu terorist. Ce faci aici, ce s-a întâmplat?”. „Păi, să vezi că m-au luat din comună ca zidar, să lucrez la Casa Poporului. Și eu, și ceilalți ne-am dus la Biserica Antim ca să ne dea de pomană. Vin şi nu mai ştiu ce”… Aveau trei rânduri de haine pe ei, pentru că la Casa Poporului nu intrai decât dacă aveai permis de intrare, şi ei aveau vreo trei legitimații. Aveau trei rânduri de haine, pentru că pe lângă hainele lor de lucru își mai puneau o pufoaică, o salopetă sau alte haine mai groase. That is crack police work, General Voinea! Only how do you explain the fact that other dead or captured terrorist suspects, in Sibiu, in Bucharest, and elsewhere, seemed to follow the same practice of three layers of clothing and multiple identity cards? A few photos and testimonies below. 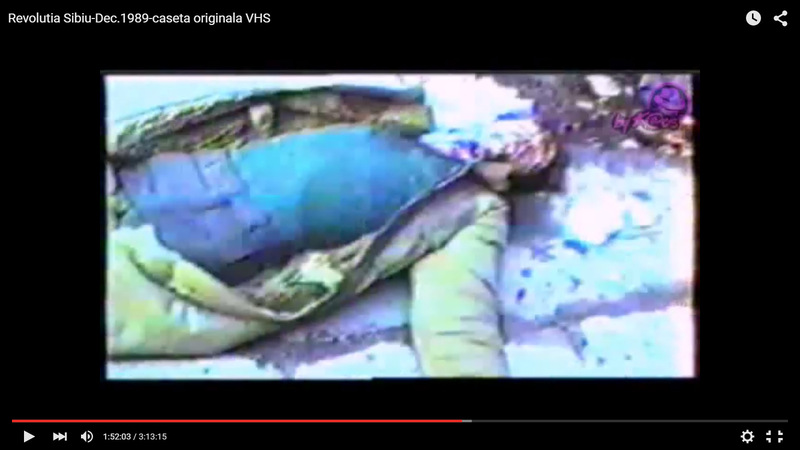 My thanks to Claudiu Alexoaie who noted the similarity between the dead terrorist suspect in Sibiu (from the discussion between cameraman Cristian Ion and people on the video it seems like it is in reference to cartierul Hipodrom ?, but I would ask for confirmation from any reader/watcher here, thank you) and how the USLA killed out front of MApN just happened to be dressed in the same way. For added perspective, see the photo of a terrorist suspect tied to a hospital bed. Unofficially, we also know of Colonel Ghircoias’ exploits after the Ceausescu regime collapsed on 22 December 1989, exploits for which he was not charged at his trial and for which he has never been charged. 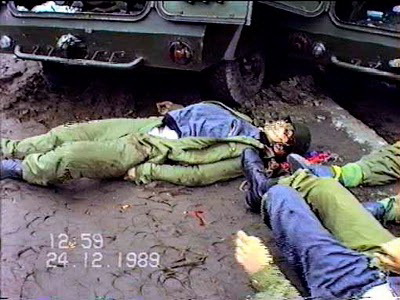 Of the 1,104 people killed and 3,352 people injured during the December 1989 bloodshed, 942 of them were killed and 2,251 wounded after Nicolae and Elena Ceausescu fled power on 22 December 1989. At the time, personnel of the communist regime’s secret police—known as the Securitate—and allied foreign mercenaries fighting to restore the Ceausescu regime—collectively christened “the terrorists”—were thought to be the primary source behind the post-22 December bloodshed. It was in this context, that doctors from Bucharest’s various main hospitals recall Colonel Ghircoias’ sudden, unannounced appearances during the last days of December 1989 and first days of January 1990. Professor Andrei Firica of the Bucharest “Emergency Hospital” recounted in a 2004 media interview largely the same details he had conveyed to the press in the summer of 1990. According to Firica, some 15 to 20 suspected terrorists had been interned at the “Emergency Hospital” in varying states of medical distress. He says he made a small file of the medical situations of these patients. A Militia colonel, whom he later was to see in [prisoner] stripes on TV as a defendant in the Timisoara trial—i.e. fairly clearly Ghircoias—came one day and counseled him to keep nosy foreign reporters away from the beds of the “terrorists,” stating ominously that “these were just terrorist suspects and he [Dr. Firica] didn’t want to wake up one day on trial for having defamed someone”! The colonel later came and loaded the wounded terrorist suspects onto a bus and off they went. Firica maintains the files he kept on the terrorist suspects “of course, disappeared.” He noted, however, that he asked his son, who had studied theater and film at university, to film the terrorists tied down to the hospital beds, and he claims he gave copies of this cassette to the Procuracy.